Monica Seles: Ana's childhood heroine. Ana Ivanovic's childhood heroine, Monica Seles, didn't scale up the ladder as slowly as the statuesque and deceptively ambitious brunette has. For Seles it was: Here I come, ba-boom, ka-boom, see what just hit you between the eyes, Steffi? New Pacific Life Open champion Ivanovic's career has been full of fits and starts, a title at the beginning of 2005 in small Canberra and then impressive wins followed by erratic losses. Her next title didn't come until Tier I '06 Montreal, when the Serbian stunned Martina Hingis for the title. But that was her sole crown that season as her serve, her fitness and her decision-making were suspect. Last year, she began to improve all these areas but still wasn't quite right yet; titles came her way in Berlin, Los Angeles and Luxembourg. But peppered in between those titles and some Slam wins over Svetlana Kuznetsova, Maria Sharapova, Jelena Jankovic and Nicole Vaidisova were bizarre upsets and significant losses to Justine Henin, Venus Williams and to Sharapova. Did she believe she's ready for prime time? She wasn't quite ready for prime time, because she wasn't sure if she quite belonged. 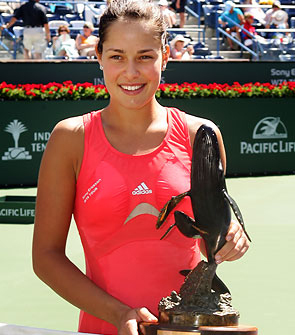 Seles won seven Slam crowns before she was 20, the age Ivanovic is now. Sharapova won her first Slam at 17, Martina Hingis at 16. Ivanovic is a more impressive athletic specimen than all of them, but her heart, head and technique were all in question. But a new Ivanovic arrived in Australia, with added muscle, minus a few pounds, smarter and trusting her racket and head. There she out-fought Venus and came back on Daniela Hantuchova, but let her emotions get the better of her while trying to think her way through points against Sharapova. Then came admirable play in Fed Cup, an injury in Doha, a sporadic and limping loss to Elena Dementieva in Dubai. But she picked herself up by her long ponytail in the desert, winning her first Tier I title in the US by blasting second-seed Svetlana Kuznetsova 6-4, 6-3 for her first Pacific Like Open title. "I needed more time to get mature and to realize that potential I have," Ivanovic said. "My coaches always believed in me by working with me, and they always said I had potential to win Grand Slams. As long as I didn't believe it inside, it was impossible for me to do it. But now slowly I believe that I can do it, and also competing against top players and beating them regularly. Trying to win a big tournament, that's also something that gives you confidence and it's necessary in order to win a Grand Slam. I think I'm in a good way." After winning the Pacific Life: confidence to win a Slam? She sure is, but let's see if she can back it up. If there is one glaring positive that she can take out of the tournament: For the first time, she came into a Tier I as the top seed and was never completely knocked off her stride. She could have been knocked out by Francesca Schiavone on Stadium 3, but survived. She out-muscled the tough Vera Zvonareva, toyed with her in-country rival Jelena Jankovic and showed a much more penetrating forehand than Kuznetsova. "I was a little bit nervous coming into this tournament," she said. "It's such a strong field and still I'm No. 1 seed. Obviously more pressure comes into the play. The first few matches I was more nervous, but then I just started to focus on each match and not even think about whom I play, just to do what I have been doing in practice. So thinking technically what I got to do and as the tournament was going on and on, I played better. So I was really happy about that." Kuznetsova had played very well during the event, tackling Sharapova in the semis with a fast, determined attack. But Ivanovic got off to a fast start and never let Kuznetsova dictate in the match, keeping the points short, daring her to get into crosscourt forehand rallies, keeping her off balance with her serve. Big forehand winners--a Ivanovic strength. She kept clean in backhand rallies, placed her serve well and received a number of negotiable mid-court returns and consistently changed direction. She broke the Russian to 5-4 in the first set behind two gigantic forehand winners that even the quick Kuznetsova was forced to watch whiz by. She blasted a forehand down-the-line, return-of-serve winner to break Kuznetsova to 4-3 in the second set, and then in the final game, cut loose with another forehand off a good Kuznetsova serve to win her sixth career title. And although Ivanovic is a well-spoken, sometimes cool-headed woman, she let out a girlish squeal of delight that nearly pierced the windows of the corporate boxes that surround the stadium. "During the match to keep it inside and to control it," said Ivanovic, who nailed 30 winners in the match. "Even if I'm angry or when I'm positive sometimes I do little squeak. I don't try to do it or I don't try to control it. It was a lot of emotion and tension built up inside, so it was just a moment of happiness." The ambition to be number one. She has every right to be happy, because now her pre-tournament vow of being a serious contender for No. 1 this year has to be taken quite seriously. She's a better decision-maker, is adding more shots and, if she maintains her vow of charging net more, could sport an all-around game that could rival top-ranked Henin. But like Djokovic, she needs to follow up her impressive run in Miami next week, for as good as she's been, Ivanovic has rarely been able put together two brilliant runs in a row. "I have big goal, you know, to make it one more step in the rankings and to become No. 1," she said. "It's very tough competition, and I think there are many, many players that are really close in achieving that. So that's my goal definitely. But I don't want to get overexcited about it. I'm really enjoying my time and I'm playing some good tennis and I worked hard for it. The hard work is paying off, so I'm just happy to see that. But that's definitely my goal, to continue strong next week. There are tough opponents even in the first few rounds. The nerves are a little bit more involved in the first few rounds. But coming from this tournament I have confidence." TennisReporters.net is the world's leading subscription based source of tennis commentary, opinions, and features from the world professional tour. At TennisReporters.net, the world's best known tennis journalists give you the straight insight into what is really happening, and aren't afraid to describe the pros just the way they are. Matthew Cronin, founder of TennisReporters.net, is one of the most prolific and insightful journalists working in the sport of tennis. Matt has covered men's and women's pro tennis for the past fourteen years, traveling the world to develop his unique first hand perspective on every aspect of the game. Matt is also the managing editor of Inside Tennis magazine, and has written extensively for the official Grand Slam web sites. He is a regular contributor to Reuters and did the play-by-play on the first web radio broadcasts of the US Open finals. A former co-president of the International Tennis Writers Association, Cronin resides in Moraga, Calif., USA, with his wife, Patti, and their children, Cassandra, Connor and Chiara.